New Kent’s Hannah Gentry focuses on her return shot against a Grafton opponent. 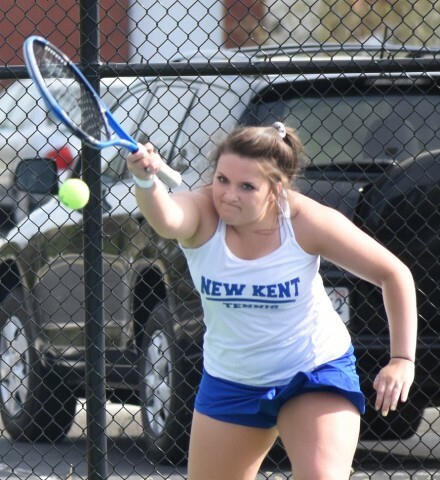 New Kent’s Lady Trojans tennis team fell at home to Grafton in an Apr. 11 Bay Rivers match-up. The Lady Trojans record drops to an even .500 (5-5) on the season. Singles: Cloud (G) def. McCartney (NK) 6-2, 6-0; Ogusu (G) def. Gentry (NK) 7-5, 7-6; O’Connell (G) def. Epps (NK) 6-1. 6-3; Phan (G) def. Butler (NK) 6-0, 2-6, 1-0; Vora (G) def. Fowlkes (NK) 7-5, 6-3; Vaillancourt (G) def. Coutu (NK) 6-7, 6-2, 1-0. Doubles: Cloud/O’Connell (G) def. McCartney/Gentry (NK) 9-8; Butler/Coutu (NK) def. Vora/Dianali (G) 9-8; Epps/Fowlkes (NK) def. Edwards/Tranitham (G) 8-0.